* This is my column in BusinessWorld last July 12, 2018. Among the EPDP lectures that I enjoyed — all held at the UP School of Economics (UPSE) — were those given by the private sector players. Here are some key points they made followed by my comments. 1. “Natural gas: Addressing the energy trilemma and powering our energy needs” by Mr. Giles Puno, First Gen, August 2017. The first two points sounded like they were seeking special treatment from government and this is wrong. Setting the energy mix should be done by the market, not government. Government should stay out of building or financing or guaranteeing the construction of the LNG terminal and let interested private players put their money where their mouth is. 2. “Retail Competition and Open Access (RCOA): The Power of Choice” by Mr. Miguel Aboitiz, Aboitiz Power, Sept. 14, 2017. True. RCOA is among the best provisions of the EPIRA law of 2001. It liberalizes and allows the contestable customers to move away from geographical monopolies (private DUs or electric cooperatives) and allow them, to choose from three dozen or so retail electricity suppliers (RES). 3. “Enhancing Fair and Economic Competition” by Dr. Francisco L. Viray, Phinma Energy, Oct. 5, 2017. “SUPPLY = DEMAND + LOSSES. The above equation is a big and explicit warning to advocates of “renewables only” lobbyists, activists, and developers. Demand is high in the Philippines with its 106 million population that expands 1.7 million a year, net of death and migration. Losses from scheduled maintenance shutdowns and unscheduled shutdowns can be substantial, especially if the power plants are old and aging. So high demand plus high losses would require high supply at stable, predictable capacity. 4. “Optimization of Supply” by Mr. Chrysogonus F. Herrera, MGen, Oct. 26, 2017. Amen to Chris’ points. The EPIRA, the Wholesale Electricity Spot Market (WESM), and RCOA are all working and running full steam. A government-mandated power generation mix is wrong and often cronyism-inspired. Let the electricity consumers decide what is good and desirable for them. Make sure that cheaper and reliable electricity supply is available. 5. “Delivering Clean and Green Energy to the Philippines” by Mr. Stewart Elliott, Energy World Group (EWG), Nov. 23, 2017. Throughout his presentation, Mr. Elliott never mentioned things like “government fiscal and non-fiscal incentives for LNG terminal and development” at all. He just wants stable long-term policies not subject to arbitrary changes midway. Amen to this kind of investment attitude. 6. “Optimal Investment Decisions in Generation” by Mr. Eric T. Francia, Ayala Energy, Feb. 8, 2018. This is practical advice from one of the country’s biggest business conglomerates, the Ayala Corp. It recognizes the practicality of coal and gas while pushing their corporate advocacy for renewables with storage. 7. “Cheap Electricity for a First World Philippines: The 24/7 Solar-Storage Revolution” by Mr. Leandro Leviste, Solar Philippines, Feb. 22, 2018. Far out. If solar is indeed the “least cost,” we should have abolished the feed-in-tariff (FIT) scheme of guaranteed high price for 20 years for solar, from P9 to P10+/kWh when coal-gas prices are only P4-5/kWh and can be reduced to P2/kWh at off-peak hours. The continued demonization of coal — articulated explicitly by Mr. Puno and Mr. Leviste in their presentations — is based on emotionalism and desire for government partiality, for two reasons. 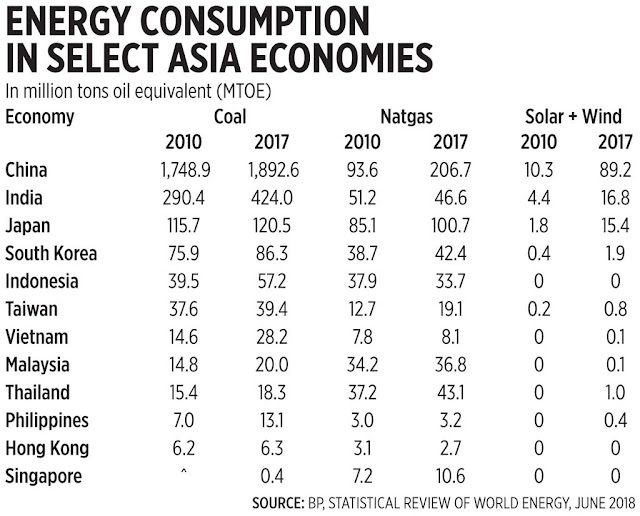 One, our coal use until 2017 remained small compared to our Asian neighbors, only 13.1 mtoe or less than 1/2 of Vietnam, only 1/3 of Taiwan, 1/4 of Indonesia, 1/7 of South Korea, 1/9 of Japan, and 1/144 of China. And yet that small coal consumption provided 50% of total electricity production in the Philippines in 2017. Two, even in developed and “green” Asian economies like Japan, South Korea, and Taiwan, solar and wind energy production remains very small, which speaks of their non-reliability and non-dependability and may even be part of economic underdevelopment, if pursued to the max (see table). The market and the consumers, not government, not the environmental activists and renewables developers, should set the appropriate energy mix. This is one of the important lessons, explicit or implicit, that one will derive from attending or reading the various lectures at EPDP.